Can you believe it's October already? This year has just flown by but I'm really excited for autumn and winter. Especially when it comes to all the amazing beauty releases around Christmas time. This month's LookFantastic Beauty Box had been specifically designed to beat the post-summer blues and prepare ourselves for the upcoming season. They have included six amazing beauty products that will leave your skin feeling and looking its best. 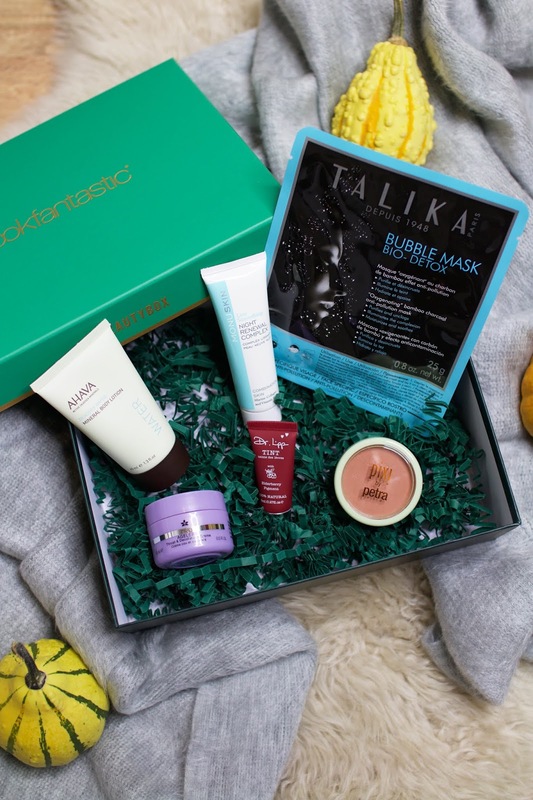 To me these lovely autumn nights are pretty much made for pamper sessions and this box will give you everything you need. 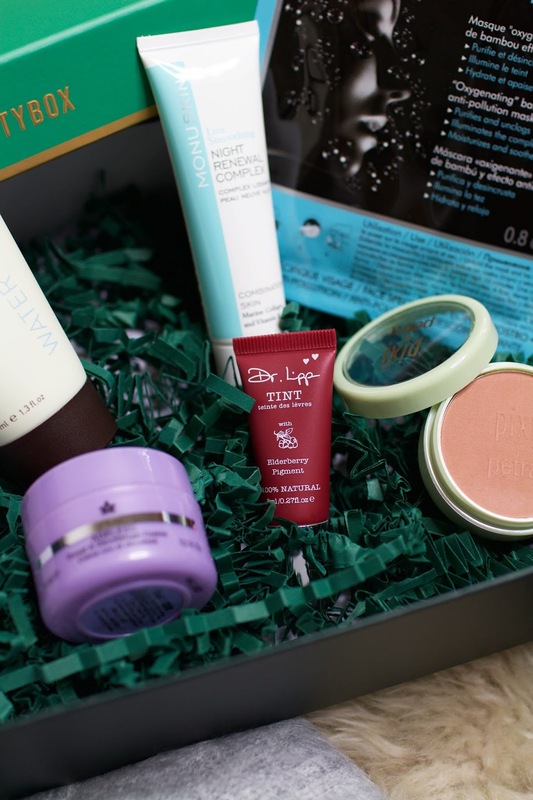 Read on to find out more about the October Beauty Box! The first product is a sample of the Monu Night Renewal Complex - a beauty treatment that will refresh and rejuvenate your skin overnight. This complex contains Marine Collagen and Polysaccharides to revitalise your complexion and smooth out fine lines. The texture of this cream feels super lightweight and sinks into the skin fairly quickly. I love using these kind of treatments at night time because your skin's ability to absorb active ingredient peaks as you sleep. The next product is the Prai Throat & Decolletage Cream. This #1 selling cream is supposed to be a real lifesaver as it helps to improve crepey skin on your neck and brighten and diminish age spots. I have never used a product like this before so I'm excited to give it a try. Next up we have the Dr Lipp Elderberry Lip Tint - a beautiful balm that leaves your lips soft and smooth with a super glossy finish. It instantly relieves chapped lips and feels super moisturising all day long. This month you will also get a sample of the Ahava Mineral Body Lotion which uses the power of Dead Sea water to increase skin's moisture level. This lotion is packed with amazing skin-friendly minerals such as magnesium, calcium and potassium. I love using this product after a shower to nourish my skin, especially when the weather is getting colder my skin tends to get a little dry and flaky so this comes as a real lifesaver. The last skincare item is the Talika Bubble Mask Bio Detox. You guys know I'm a huge fan of all sorts of face masks and I do them religiously once or twice a week. This is an innovative foaming charcoal mask that contains thousands of nourishing microbubbles and promises clear, bright and glowing skin. I can't wait to give this mask a try on my next pamper evening. Last but not least, you also get a Pixi Fresh Face Blush in the colour. I have never tried Pixi makeup products before so I was really happy when I found this blush inside the box. It's such a beautiful, natural colour that gives your skin a radiant and fresh glow. 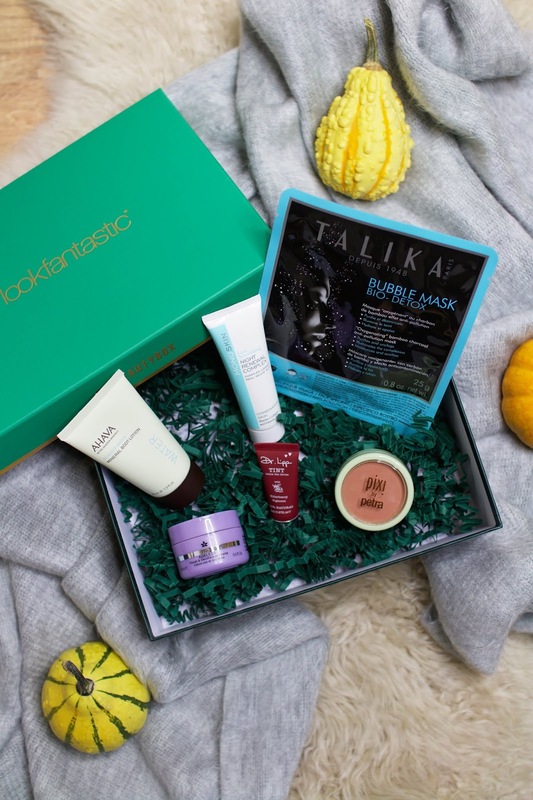 Have you guys received your October Beauty Box yet?